Hi crafters! Today I am happy to be a Growing in Unity Girl for 2017 and welcome to Day 2!.. This event lasts for 5-days and be sure to comment each day because at the end of the week I will pick two lucky winners who will get 25 random Unity stamps. So be sure to leave some love from all the GIU gals participating this week! 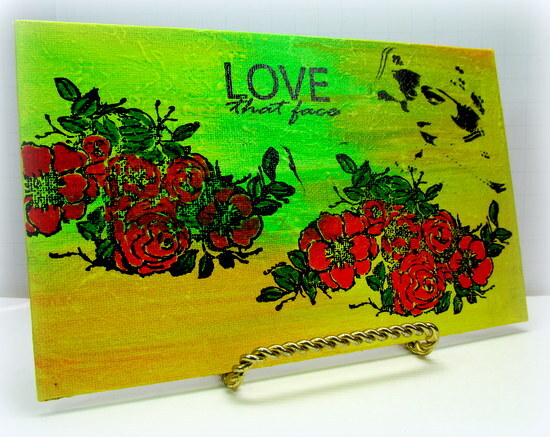 For my 2nd day I created this mixed media piece “Love that Face” stamps. I used Dylusions paints from Ranger and Fabercastell Pitt Brush pens. Be sure to stop back by tomorrow and leave a comment for your chance to win 25 random Unity Stamps!!!! Fabulous coloring Monica! I love those beautiful flowers, the image and your background colors are perfect!